Wahama junior Brodee Howard clears an obstacle during the Class A 4x110m shuttle hurdles relay event on Friday at Laidley Field in Charleston, W.Va.
CHARLESTON, W.Va. — Back on the board. 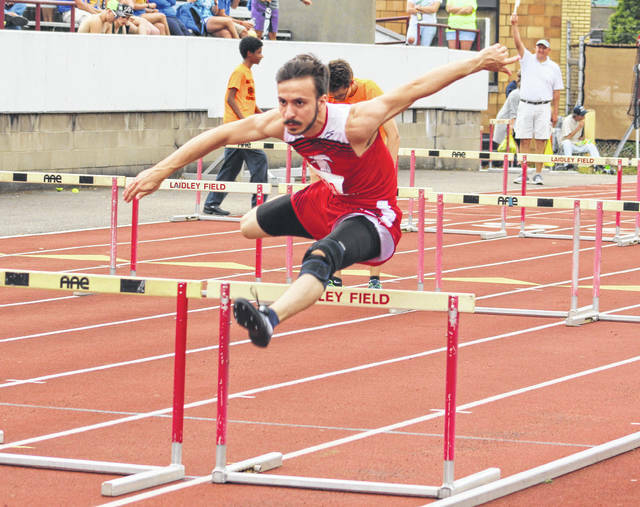 The Wahama track and field teams both came away with points for the first time in five years this weekend at the 2018 WVSSAC Class A track and field championships held at Laidley Field on the campus of the University of Charleston. The White Falcons and Lady Falcons combine to score just three points total, but each squad came away with at least one point — a first since the 2013 campaign. The Wahama boys scored two points and placed 23rd out of 25 scoring teams, while the WHS girls scored one point and tied Midland Trail for 25th out of 28 scoring teams. The White Falcons extended their scoring streak to seven consecutive postseasons after junior Brodee Howard finished fifth in the 110m hurdles final with a time of 16.97 seconds. Senior Christopher Hesson was ninth in the shot put (39-8¼), while senior Johnnie Board placed 10th in the pole vault with a cleared height of 10 feet, 6 inches. Junior Brady Bumgarner was 12th in the 100m dash (12.10) and also placed 15th in the 200m dash (24.66). The quartet of Board, Bumgarner, junior Jacob Lloyd and freshman Josh Frye placed 12th in the 4x200m relay with a time of 1:38.21. Board, Bumgarner, Howard and sophomore Zach Roush also finished 14th in the 4x110m shuttle hurdles relay with a mark of 1:08.64. Magnolia won the Class A boys championship with 80 points, with St. Marys (72.5) and Doddridge County (69) rounding out the top-three spots. Freddy Canary of South Harrison was the Class A high-point scorer with 38 points. The Lady Falcons ended their four-year scoreless cycle at state after senior Kaleigh Stewart placed sixth in the long jump with a leap of 15 feet, 3¾ inches. Sophomore MacKenzie Barr also placed eighth in the pole vault final with a cleared height of 7 feet, 6 inches. Stewart, Barr, junior Skylar Riffle and junior Camryn Tyree also landed a 14th place effort in the 4x100m relay with a time of 57.54 seconds. Doddridge County won the Class A girls championship with 89 points, with Williamstown (68) and Charleston Catholic (66) rounding out the top-three spots. Jonna Ferrell of Doddridge County was the Class A high-point scorer with 40 points. Of the 11 Wahama state qualifiers, only three come from the senior class. Visit runwv.com for complete results of the 2018 WVSSAC Class A track and field championships held at Laidley Field.